SLUDGEHAMMER are now ready to pummel the masses with their new album “Antechamber” ready to destroy eardrums as of April 12, 2019. Heavy and groovy, the Toronto quintet delivers the goods with astounding precision and the confidence of a world-class band. Fans around the world, especially those with an ear for Decapitated, Pantera, Lamb Of God, and Cannibal Corpse can dig into this slice of groovy progressive melodic death brutality. Heavy and groovy, SLUDGEHAMMER delivers the goods with astounding precision and the confidence of a world-class band. The first single “No Control”, with its ferocious drumming that collides with equally aggressive riffs and vocals, is a solid introduction to the pummeling album that “Antechamber” promises to be. Fans around the world, especially those with an ear for Decapitated, Pantera, Lamb Of God, and Cannibal Corpse can dig into the single now and wait for the rest of “Antechamber” on April 12, 2019. Set to unleash their debut infection “The Virulent Host” on March 22, 2019, via PRC Music, the band is spreading their virus of extreme metal with the new music video for the album’s title track via MetalInjection.net. “The Virulent Host grapples with a hypothetical human extinction, told from the perspective of the last person on earth. It is one of our favorite songs on the album and always gets people moving in the pit. Joe and James from Dark Moon Productions did a fantastic job with the video, and Capital Rehearsal Studios was gracious enough to let us take up not one, but both sides of the building.” – Adam Pell (vocals/guitar). Album pre-order available on iTunes, Amazon, PRC Music Store. Album pre-order available on iTunes, Amazon. 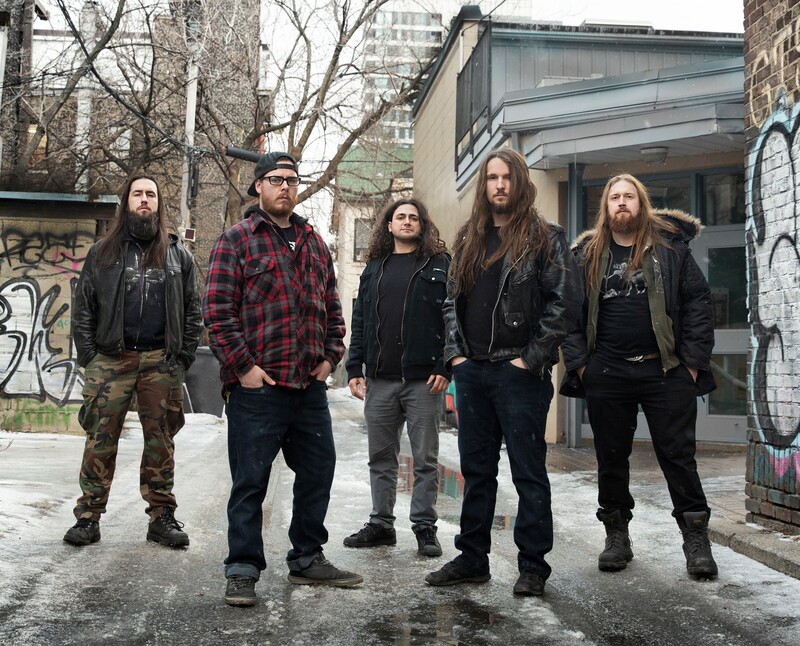 From the darkness of Northern Quebec, Canada, Rouyn-Noranda’s BACKSTABBER will be unleashing their debut album “Conspiracy Theorist” this Friday, February 15, 2019. The 10 track album is a fierce full-length that encompasses themes about scandals, critiques of mainstream media and conspiracies such as hollow Earth. Remaining old school, there are no clean vocals or breakdowns here, just a solid and mature death/thrash metal album, with good flow and clear thought in the tracks and compositions. Teaming up with Metal-Rules.com, BACKSTABBER is premiering the full stream for their debut album before its official release. Album CD order and download available worldwide as of February 15th, 2019 through Bandcamp, iTunes, Spotify, and all major online retailers. Hailing from Rouyn-Noranda, Quebec, Canada, Backstabber is a formidable death/thrash metal trio inspired by conspiracies, new technologies, philosophy, and history. Covering a vast number of themes throughout their music, Backstabber can be likened to a ‘loose cannon’ with no foreshadowing of what direction they will take next, musically. Starting with themes and gradually adding riffs, drums, bass and finally vocals, they pride themselves on complimenting their compositions with energetic and interactive live shows, the entire reason for them writing their music. Eager to bring raw and fierce metal to the ears of listeners, Backstabber has recorded their first full-length “Conspiracy Theorist” set to be released February 15, 2019. Backstabber has shared the stage with Cattle Decapitation, Depths of Hatred, First Fragment, Ending Tyranny, Insurrection, Blinded by Faith, Aepoch and more. Signed to PRC Music, ACCURSED SPAWN will be unleashing their debut full length “The Virulent Host” on March 22, 2019. With a unique sound and style that stands apart from the crowd, the full length is the next step in the band’s evolution of musical expression to follow a mix of demos and EPs since 2010. “‘The Virulent Host’ represents a huge step up in all ways for Accursed Spawn: the production is exceptional (thanks to Christian Donaldson and The Grid), the hooks are quite memorable, the string work is phenomenal (between the blistering solos and fretless bass, there’s quite a lot in there for string players), and the delivery is both consistent but also fresh. It’s our first ever “full length” record and fans that have been with the band since our inception should be quite pleased with the delivery. We’ve road-tested most of the songs at this point, and the mosh pits speak for themselves.” says drummer Jay Cross. From the darkness of Northern Quebec, Canada, Rouyn-Noranda’s assaulting BACKSTABBER will be unleashing their debut album “Conspiracy Theorist” on February 15, 2019. The 10 track album is a fierce full-length that encompasses themes about scandals, critiques of mainstream media and conspiracies such as hollow Earth. Remaining old school, there are no clean vocals or breakdowns here, just a solid and mature death/thrash metal album, with good flow and clear thought in the tracks and compositions. Leading up to its release, the band has teamed up with NoCleanSinging.com for the premiere of their new lyric video “Geo Engineering”, a track based on Paul Brennan’s speech at the Council on Foreign Relations in 2016. Brennan, then head of the CIA, explained that with a program called Stratospheric Aerosol Injection, we could lower the global temperature by 2 degrees Celsius, estimated at around 10 billion dollars per year. “Conspiracy Theorist” will be available worldwide as of February 15th, 2019 through Bandcamp and iTunes. Single “No Privacy” is available for FREE download at https://backstabbermetal.bandcamp.com/track/no-privacy.